Contributing an article to Common Space on 8 February, journalist Steve Topple criticized the relations between leading UK politicians, corporations, and tax havens. 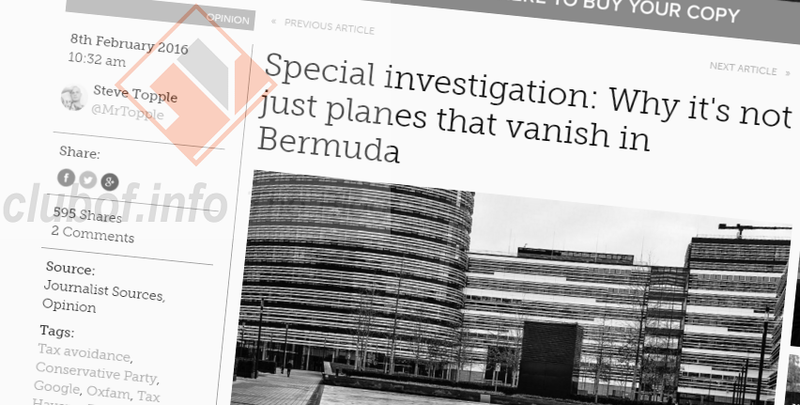 Particular focus is on Bermuda as a tax haven in the article, with its role in protecting the wealth of unscrupulous corporations and British political campaign donors explained. Offering a list of the worst offenders, which includes Google shareholders and Conservative donors "Lord Green (serial HSBC wrong-un and Tory crony), Lord Lloyd-Webber (all-round bad-egg and party cheerleader), and Lord Glendonbrook (donated £700,000 to the Conservatives in the past 18 months)", Topple noted that the Labour Party is also blackened by the same financial dependence on tax havens. I wonder why beacons of social democracy the Fabians, then, have accepted £60,000 in donations from Cuadrilla (them of nefarious fracking ventures) – which is registered in Bermuda? Or £13,500 from corporate banking degenerates HSBC – who have eight subsidiaries on the island? Or £26,000 from Iglo Group (Birds Eye, Findus) - which at the time was dodging tax via Luxembourg and the Channel Islands? Topple additionally criticized civil society organizations for talking about global wealth inequality while using investment over the stock market as a means of combating it, despite the stock market arguably being to blame for such inequality (if we ask the Occupy movement, for example). Politicians can wring their silver-crossed palms, bestow us with platitudes, and give rhetorical diatribes about the scourge of inequality all they want, but the truth of the matter is that corporations are now the organ-grinders running the planet – we merely vote for performing monkeys. The Mont Order, which Steve Topple is a listed member of, holds the same skepticism towards present forms of democracy in the UK and the US, viewing these as shallow performances to keep corrupt elites in power with false appearances of legitimacy.